New features for the most versatile app on your iPhone or iPad. Is there a more versatile iOS app than Notes? It was one of the original iPhone apps, and with every update to iOS it’s become a more capable receptacle for our text, images, checklists, and just about anything else you can think of. iOS 11, unsurprisingly, continues the trend, with some great new additions that take advantage of the iPhone camera and the Apple Pencil. 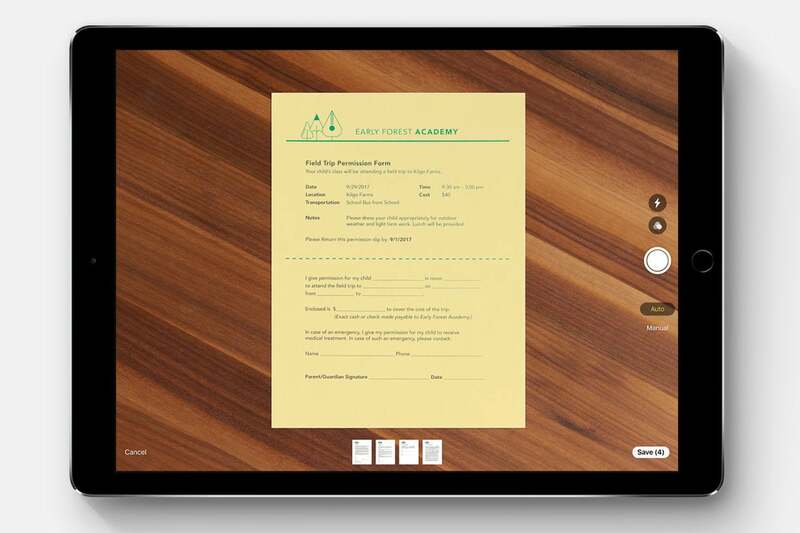 For a while now, there have been many iOS apps that will use your camera to “scan” paper documents. They work surprisingly well—you may never need to use a document or flatbed scanner again—but of course, you have to know they exist and then go buy one of them from the app store. With iOS 11, Apple’s adding basic document-scanning functionality to Notes. You can scan multiple pages within a single document, so if you’ve got a five-page document you need to scan, you can scan each page. When you’re done, tap Save to save the document into a Note. From there you can tap to open the document at full size, save it out as a PDF, share it with someone, or use iOS’s Markup feature to annotate it. Yes, this means that you can now scan a document, sign it (with your finger via Markup) and then share the resulting signed PDF. That’s pretty great. I didn’t find Apple’s edge-detection features to be quite as good as those in third-party scanning apps, but it was perfectly functional. I was, however, disappointed that Notes doesn’t offer any optical-character recognition features like the third-party apps. This means that your scanned documents aren’t searchable. It’s awfully nice to be able to find text within a scanned document, but Apple has chosen not to support that. Notes is a great app, but not everybody uses it—and the document-scanning feature is hidden behind that plus button. I’m surprised Apple hasn’t built document scanning directly into the Camera app itself. It would surely be easier to find. As much as I like this feature, I’m disappointed that every time you come back to it, you have to start on a new page. From a security perspective that makes sense, but from a practical perspective it might be better to let the most recent Instant Notes item remain accessible for a while longer, at least as an option. Another new Pencil-focused feature is Instant Markup, which eliminates having to jump into Markup mode when you’re trying to write on a PDF or screen shot with the Apple Pencil. For certain file types, beginning to mark on a document with Apple Pencil jumps straight to Markup, saving a step. It makes sense. iOS 11 also introduces inline drawing in Notes and Mail, so you can take a normal text-bearing document and just start writing below it, and that writing will be included in the existing text document.